Fulham have signed Andre Schurrle on loan from Borussia Dortmund. The forward joins the Cottagers on a two-year deal as Fulham return to the top-flight for the first time since the 2013-14 season. “I’m so happy to be here, I can’t wait to get started,” Schurrle told Fulhamfctv. ”Fulham were the first club that showed interest in me – that was something that I appreciated a lot, and one of the reasons I wanted to come here. A World Cup winner with Germany in 2014, Schurrle brings Premier League experience as well, having featured for Chelsea in the 2013-14 and the 2014-15 campaigns. While Schurrle played in 30 Premier League games in his debut campaign in England, starting 15, he fell out of favor in his second and made a midseason move to Wolfsburg. He would later go on to Borussia Dortmund in the summer of 2016, and managed three goals and six assists over 33 Bundesliga games for the club. 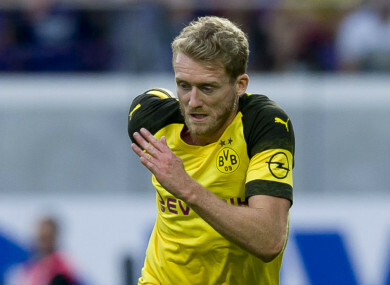 A DFB-Pokal winner with Wolfsburg and Dortmund, his success in 2014 with Brazil and his years in the German and English top-flight has Fulham vice-chairman Tony Khan excited about what Schurrle can bring to the newly promoted side. “Andre has been a top target for us, as he has for other clubs throughout Europe, so I’m very happy that our pursuit was successful,” Khan told the club’s official website. Fulham finished third in the Championship last season, but made their way back to top-flight by virtue of victory in the playoff. The team has previously added goalkeeper Fabri from Besiktas and Jean Michael Seri from Nice, beating rival Premier League clubs to the signature of the Ivory Coast international. Email “World Cup-winning German international joins Fulham on loan”. Feedback on “World Cup-winning German international joins Fulham on loan”.